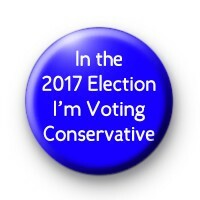 Voting Conservative Badges. In the 2017 general Election I will be Voting Tory. Not Labour or Liberal Democrat. Vote for Theresa May button badges.